Following the data to understand environmental drivers of microbial genome size. ​ Poster image: "Graffiti highway" in Centralia - Old route 61 used to be a busy thoroughfare before the Centralia fire started. Pressure from the underground fire caused a fissure in the macadam, and now the road has been re-routed and its original track abandoned. We use the Centralia fire as a model to investigate the capacity of wild microbiomes for resilience after extreme disturbances. I have to admit: we didn’t start this project thinking about microbial genome sizes. Active vent in Centralia, plus Ashley's shoe. Active vents are created under pressure from the fire's steam and gases. For these insights, we can thank the prepared minds of two graduate students in my research group at Michigan State, Jackson Sorensen and Taylor Dunivin. They made the initial, important observation that average microbial genome sizes soundly decreased with increasing temperature over a wide temperature gradient in our model field ecosystem, Centralia Pennsylvania. But, I am getting a bit ahead of myself. 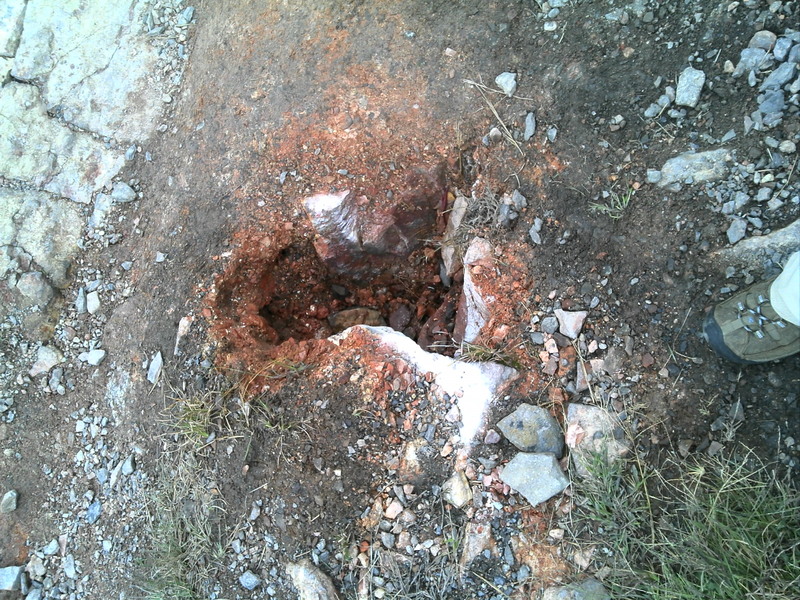 Let me first tell you about Centralia and how we ended up there. Centralia, Pennsylvania is the site of an underground coal seam fire that ignited in 1962 and has been burning slowly along two fronts since them, advancing at rate of 3-7 m/y along the coal seams and drastically elevating surface soil temperatures, which have been measured as hot as 400 degrees Celsius, but more recently around 60 Celsius. The fire depth varies (according to the coal seam depths), but it is estimated to be around 69 m below the surface in some places. Over the next decades after the fire ignited, the town of Centralia was relocated, its buildings razed and zip-code revoked. However, the fire in Centralia continues to spark (ha!) intrigue. Some of the more notable pop-culture Centralia shout-outs include author Bill Bryson’s description of Centralia in his 1998 book “A Walk in the Woods” (about the Appalachian Trail), as well as a 2006 horror film, Silent Hill, which is said to be inspired by Centralia. The ongoing Centralia fire is an example of a severe “press” disturbance that impacts across multiple microbial generations. In my research group, we use Centralia as a model ecosystem to investigate how wild microbiomes respond to, and how they eventually may recover from, an extreme and unexpected disturbance. In Centralia, soil microbial communities serve as miniature models to investigate the ecological concepts of stability and resilience. 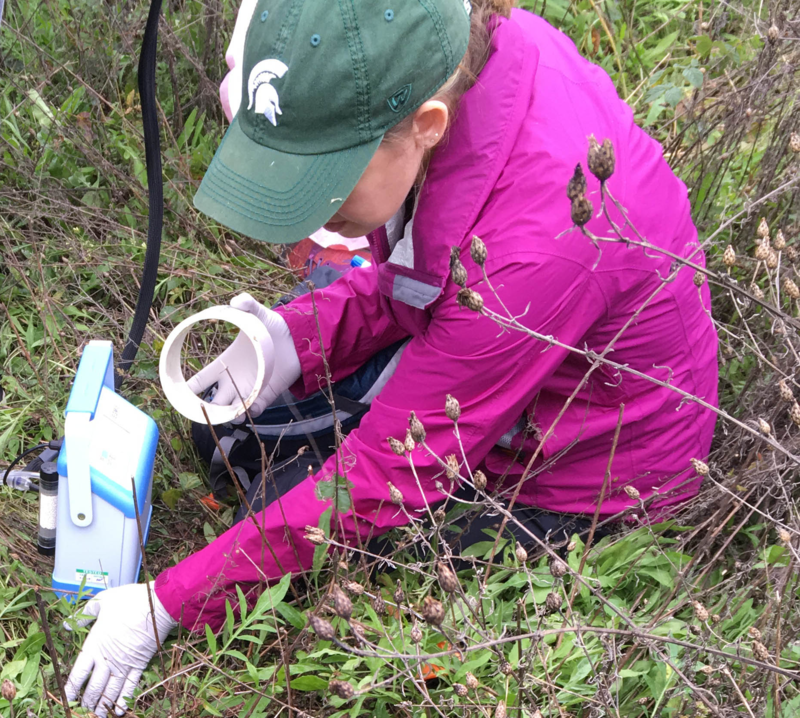 We’re grateful for Centralia research support from the National Science Foundation Division of Environmental Biology and from Michigan State University. Soon after starting my faculty position at Michigan State, Tammy Tobin, my collaborator and mentor at Susquehanna University, and I set out with a new lab technician in my group, Keara Grady, to chart out a new sampling schema in Centralia. We wanted to capture not only currently active vents (steaming sites where the fire had fissured the surface), but also a gradient of historical fire activity. We used the literature and records from the Pennsylvania Department of Environmental Protection (thanks to Timothy Altares for his help to access records) to sample a fire-impact “gradient” of soils that were hot in the 1980’s, 1990’s 2000, and 2010’s. In this way, we had some soils that had been recovered in temperature for several decades, as well as soils that we currently hot from the fire. Measuring carbon dioxide emissions from Centralia soils. While some active vents have higher carbon dioxide emissions than ambient soils, carbon monoxide measurements have been consistently low to undetectable at all sites. 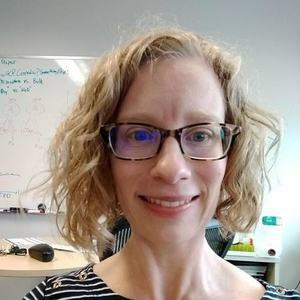 When the Department of Energy’s Joint Genome Institute released their 2014 call for small-scale microbial metagenome sequencing proposals, Tammy and I were ready to respond with our newly sampled Centralia soils and their extracted metagenomic DNA. We selected 12 soils that best represented the historical and temperature gradient for “high-quality draft” metagenomes, which was the maximum effort permitted for the small-scale JGI awards at the time. 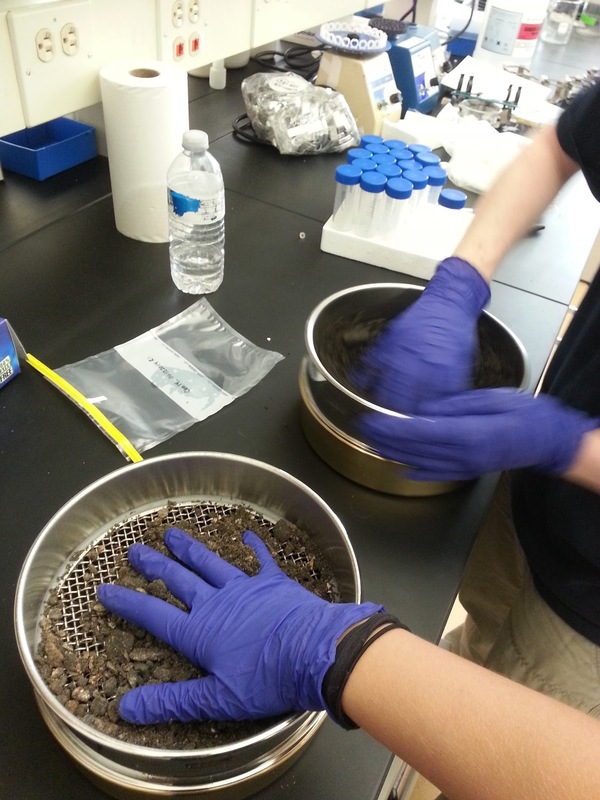 Back at the lab, sieving soils from Centralia for chemical analysis. Fast-forward to a lab-meeting discussion. Grad students Taylor and Jackson were weighing the different approaches for standardizing our newly received Centralia metagenome data. An informative paper by He et al. 2015 had recently normalized functional gene counts to a suite of single copy genes, and Nayfach and Pollard 2015 suggested to report this information as average genomic copy number for comparative metagenomics. We decided to apply this standardization to our data, and calculated average genome size as part of the pipeline. That was when Jackson and Taylor noticed the obvious trend of smaller average genomes with increasing soil temperature – our hottest active vents contained the smallest genomes. At first we questioned that there may be some error (in ecology, a correlation strength of 0.9 is nearly unheard of! ), and so I asked them to re-run the analysis. The trend was upheld, and no error was detected. Still skeptical, I asked them to use a different method to calculate average genome size. They also did that, first using phylogenetic inference from the taxonomy of our independently generated 16S rRNA amplicon dataset from the same soils, and then calculating average genome size from metagenome-assembled genomes from the metagenomes. We found that every attempt to calculate average genome size using different methods agreed with the initially observed trend! That was when we started to dig into the literature to search for precedent, and we certainly had some giants' shoulders on which to stand. We found the Sabath et al. 2013 work showing a trend of small isolate genomes with high optimum growth temperatures, reviewed Giovannoni’s multiple works (e.g., this perspective) discussing the relationships between efficiency, genome streamlining and oligotrophy in free-living microorganisms, and also considered works (experiment and observation) in aquatic systems that had suggested that in situ temperature warming could select for cells with relatively less nucleic acid. We realized that, in Centralia, there was an informative mesothermal-to-thermal gradient that supports microbial life across a wide temperature range that was unique for investigating such relationships. We also realized that observing a trend towards small genomes in soils, with their complex microbial communities and physical structures, also brought new information to the table. Centralia soil microbiomes proved unexpectedly insightful for demonstrating a community shift towards small genomes at high temperatures. We compared our metagenomes to other public soil metagenomes and soil microbial genomes, and with this were able to place our site-specific study in Centralia in a larger soil microbiome context. Sidebar: a big THANKS to all of the researchers who make their data public to promote cross-system comparisons like this, and to the databases resources that house these important data! 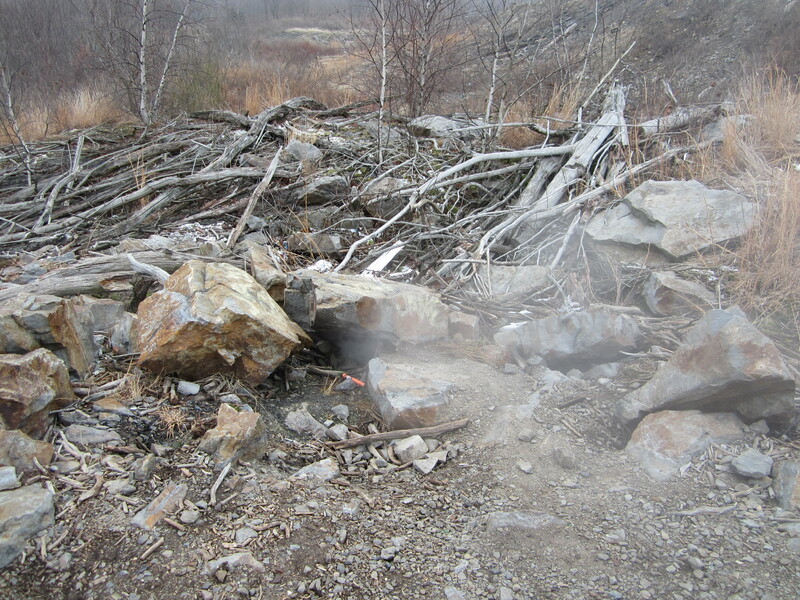 This work is a great example of how extreme environments like Centralia can provide general biological and ecological insights by considering what patterns emerge at conditions that support the limits of life. It is also an outcome of fortune favoring prepared minds. We had first to be open to following the data where it would lead, even if that path was not as we expected, and then to recognize the potential impact and context of the results. I’m proud of Taylor and Jackson for their efforts, and delighted that their work landed in Nature Microbiology! Type IV secretion systems (T4SS) are widely present molecular machines that translocate a broad range of macromolecules (e.g. proteins, nucleoprotein complexes etc.) across kingdom barriers.